The dead aren't really gone, they persist as phone numbers, social media accounts, newsletter recipients, and as members of fan-fiction forums. Digital ghosts move and connect us: we feel we know people we have only seen online just as corporations masquerade as familiar friends. In Rubik, darkly comedic interconnected stories follow Elena Rubik, her best friend Jules Valentine, and wannabe investigative reporter April Kuan, as a viral marketing scheme's motivations become cause for concern. There are the adventures of a model turned visual artist, a voice actor primarily used for tech support, enigmatic schoolchildren, clever anime characters, and more. Deftly blending the real and imagined with biting social satire, Elizabeth Tan explores the lives of her diverse group of characters with deep empathy and insight into our contemporary world. Elizabeth Tan recently completed her PhD in Creative Writing at Curtin University in Perth. Her work has previously appeared in Westerly, The Lifted Brow, Voiceworks and The Sleepers Almanac. Her webcomic, Mais Pourquoi, can be found at et-maispourquoi.blogspot.com. 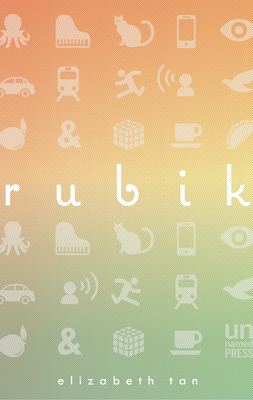 Rubik is her first collection of stories. She lives in Australia.